Wow! 1,250+ amazing backers, $110,000 in stretch goals complete, and only 2 days left till campaign end! Thanks for helping make this mountain of a game! We just hit our $110,000 stretch goal. All pledge levels will now come with 6x miniature climber markers, with rope attachments for future expansions! Saweet! We've also added in a mobile web app stretch goal for the AI climbers at $120,000. The game will still come with the AI cards and dice for those of you who prefer old school, but if we reach this stretch goal, we'll have a nice slick algorithm to speed up the automated climber turns and make more difficult game settings! 1. The campaign ends in roughly 48 hours! And our next live video is tomorrow at 7PM, Oregon Time (PST)! 2. We will be using a pledge manager called CrowdOx for awesome add-ons, language packs, and to collect your shipping and pledge information! 3. We need 370 more facebook likes, and 310 more BGG fans to get 2 free stretch goals! Help us reach those by Thursday night! 4. The MSRP of all game editions will be significantly higher after the campaign. We are looking at around $59 / $79 / $120, and that doesn't necessarily include shipping or the fact that a limited number will be produced! If you have a friend on the fence about this game, tell them to pledge a dollar for access to the pledge manager! 5. We have our final pricing for the language packs: $20 for 165 high quality linen finish translated cards, and $6 for an extra translated printed rule book (20+ pages). We plan to make the rule books available for download as well. If you think this is something you want, add it to your pledge now, and help us reach another stretch goal! Currently the languages that will be available for these cards and rule books are Spanish, Italian, French, Dutch, English, and Portuguese. Extra rule books will be available for Japanese and German languages. You can choose the option between a German or English rule book with the base game in the crowd manager. Jumbo sized mountain map cards! These are sweet for studying the best route to climb before you play, and for seeing all the different stats of the various mountain sides! Route cards made specifically for the 4 sided mountain configuration will be extra challenging, and worth more points. These are definitely climbing routes for players good at long term strategy climbing! Make sure you like our facebook page and become a fan of Mountaineers on BGG so we can get those last few stretch goals! Once again, thank you so much for your support! I'm really happy that we've added so much to this game, and can't wait for August! Keep up the climbing, and let's make these last 2 days, rock'n'roll! Corey Wright, Myles wilson, and 17 more people like this update. @Thomas: The benefit of these cards is that 1) you can see the stats of mountain sides, and easily know how much of each type of terrain there are. This makes deciding which route cards to use more easy at the beginning of the game. And 2) when other people are turning the mountain (because it is 3d), it can be hard to see your current side of the mountain. The cards let you analyze where you want to go next while other players are taking their climbing turns. @ Corey thanks those are big.. But why would i am trying to understand why would i want them? Is it just so i can see the mountain in secret and plan my routes without other people knowing, or is there something else that i am missing? I understand the extra route cards, but this jumbo cards are a bit confusing. If anyone wants to read/improve the Dutch rulebook we have at the moment, check out the online document in the campaign description! good question, and sorry we haven't added more specific instructions to the campaign yet. If you want to add upgrades, you can increase your pledge by the amount you want, or you can wait, and add them in the CrowdOx pledge manager. Whatever works best for you, but doing it sooner raises the stretch goals! But yes those two upgrades together would be $20 extra. Hope that Helps! 1. Yes the base game will support the 4 sided mountain. 2. The 4th side was unlocked in as a stretch goal. But the base that comes with it will allow you to play with either a 3 or 4 sided mountain! 3. They will fit into the box even sleeved. 4. Right again, if you have the 6 player version and wish for all players to have a set of map cards you would need to purchase 2 sets. 1) I believe the base game support 4 side mountain. It should cost him more to do two different package with only one tool difference. 2) stretch goal give you the 4th mountain board. At the same time, base game upgrade to 4 side support. 3) not sure. But I want to ask “will all sleeved cards, yes include the jumbo card (kids drink and eat while mountain climbing), fit into the box? 4) to my understanding YES, but Two pack for 6 player. I am currently backing the $99 collectors edition. Will the latest mentioned 18 jumbo sized mountain maps and 18 additional climbing routes be included with the collectors edition or will it be an additional of $20 to get those? If so, how do I add that to my $99 pledge? Thanks! 1) Is the base game meant for only a 3 sided mountain? 2) Where does the 4 sided mountain come into play? (from the $59000 stretch goal)? 3) Will all these extra cards fit in the main box? 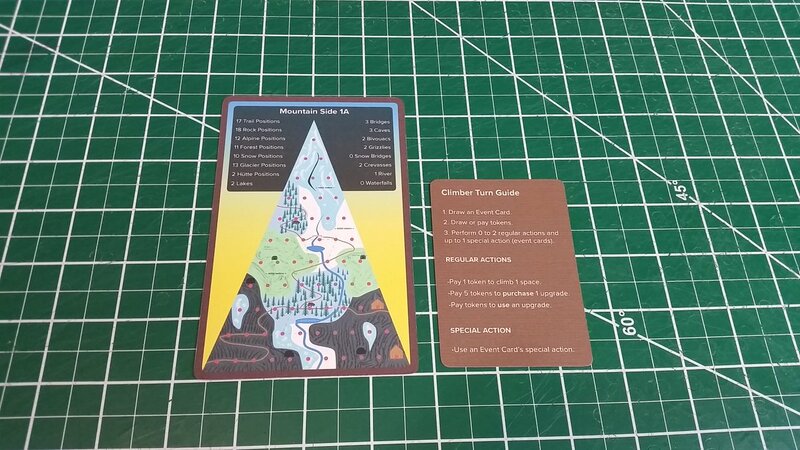 4)And for the jumbo size mountain map cards, as you explained to others, the 18x cards will make 3 sets representing the 6 doubled sided mountain bards. So that is only good for 3 players? If I want all 6(Max players) to be able to have their own set to study I would have to buy another set is that correct? @Randy, sounds good! I'll see what I can do, I might be able to do that now, anyways! Stay tuned! @Thomas, sure I'll try to post that tomorrow. Remind me if I forget! Just for reference though, jumbo cards are 3.5 by 5.5 inches, and regular poker cards are 2.5 x 3.5 inches. but in future expansion of mountain board, please make it come with an option to get 6 jumbo map. @Randy: Thanks! So, we won't provide a PnP version of these. However, the reason we are doing 18, is because we are doing 3 of each card, and yes, the cards are doublesided. So, if you ordered 1 pack, it means that in a 4 player game, you would have 3 sets of the 6 doublesided mountain maps for the people not climbing. Make sense? Great, 46$ more for me. Great. The add-on is nice. For the 18x jumbo sized, linen finished mountain maps. Could you provide a print and play version for these 18 cards. So that I can print a set for each players. Getting 6 sets is sort of expensive. BTW, why 18? isn’t there only 6 mountain boards? Is it possible to print it double side to reduce number of cards and also the cost? I want to get one set for each player and they can use as map for planning.